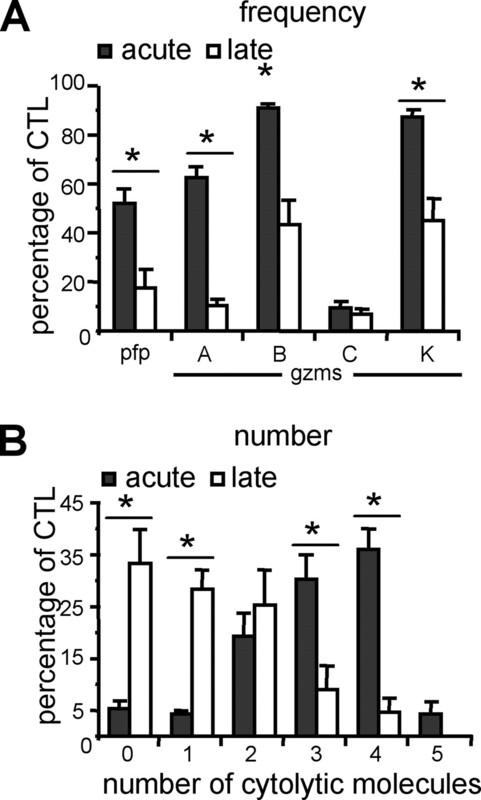 HSV-1 vs flu-gB-specific CTL do not exhibit unique Gzm preferences during acute immunity. 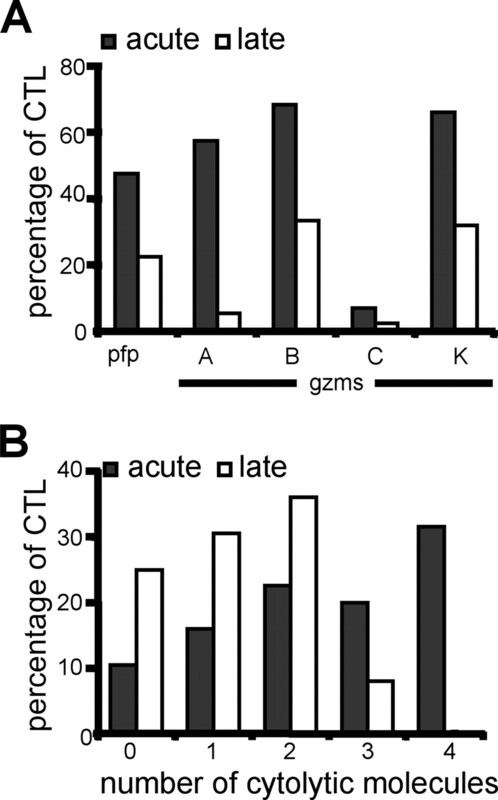 gBT were isolated from pooled spleens following HSV-1 or flu-gB infection at acute time points. Patterns of cytolytic transcripts expressed per single CD8+ CTL are shown (mean). A filled circle represents an expressed transcript. For HSV-1 infection, n = 144 CD8+ T cells harvested from six mice for three individual experiments. For flu-gB infection, n = 76 CD8+ T cells harvested from five mice for two individual experiments. Spleen-resident flu-gB-specific CTL display reduced cytolytic transcriptional profiles at late time points compared with acute immunity. 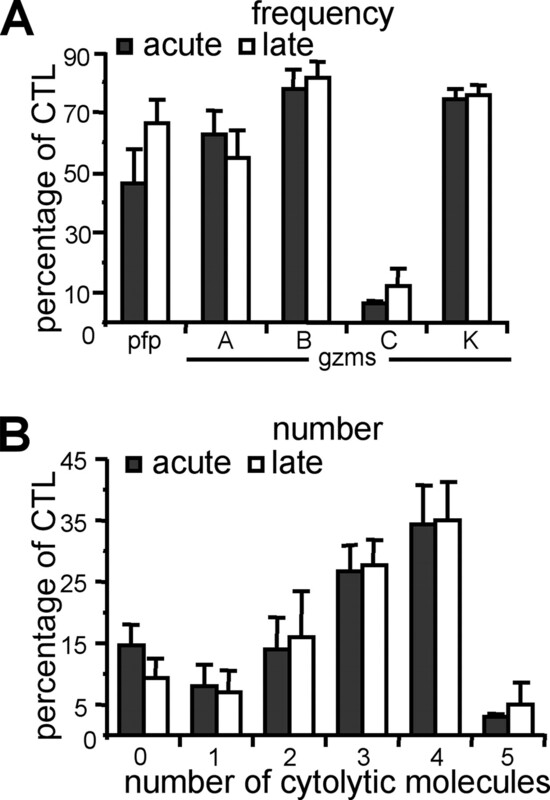 gBT were isolated from pooled spleens following flu-gB infection at acute or late time points. Frequency (A) and number (B) of cytolytic transcripts expressed per CD8+ CTL is shown (mean). For acute time points, n = 76 CD8+ T cells harvested from five mice for two individual experiments (same CTL as that analyzed in Fig. 1). For late time points, n = 90 CD8+ T cells harvested from five mice for two individual experiments. Respiratory tract-resident flu-gB specific CTL display reduced cytolytic transcriptional profiles at late time points compared with acute immunity. gBT were isolated from respiratory airways following flu-gB infection at acute or late time points. Frequency (A) and number (B) of cytolytic transcripts expressed per CD8+ CTL is shown (mean). For acute time points, n = 66 CD8+ T cells harvested from six mice for two individual experiments. 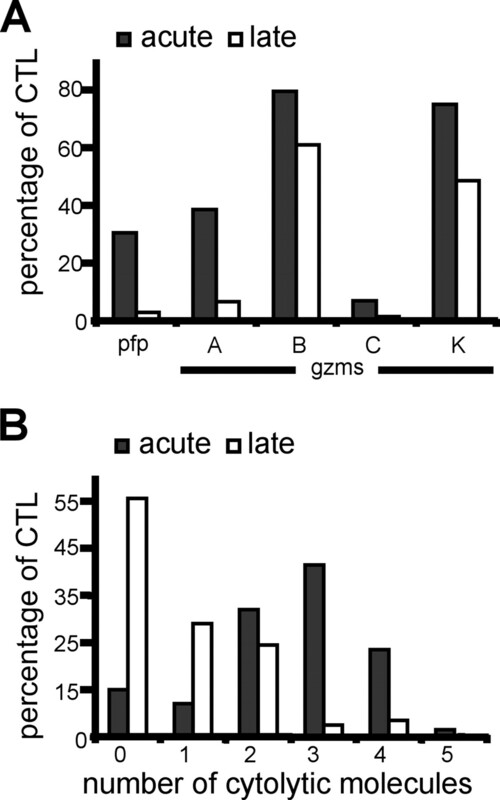 For late time points n = 57 CD8+ T cells harvested from eight mice for two individual experiments. Skin-resident HSV-1-specific CTL display reduced cytolytic transcriptional profiles at late time points compared with acute immunity. gBT were isolated from pooled skin samples following HSV-1 infection at acute or late time points. Frequency (A) and number (B) of cytolytic transcripts expressed per CD8+ CTL is shown (mean ± SEM). For acute time points, n = 146 CD8+ T cells harvested from six mice for three individual experiments. For late time points, n = 153 CD8+ T cells harvested from 15 mice for three individual experiments. ∗, p < 0.05; significantly different. DRG-resident HSV-1-specific CTL display similar cytolytic transcriptional profiles at late time points compared with acute immunity. gBT were isolated from pooled DRG following HSV-1 infection at acute or late time points. 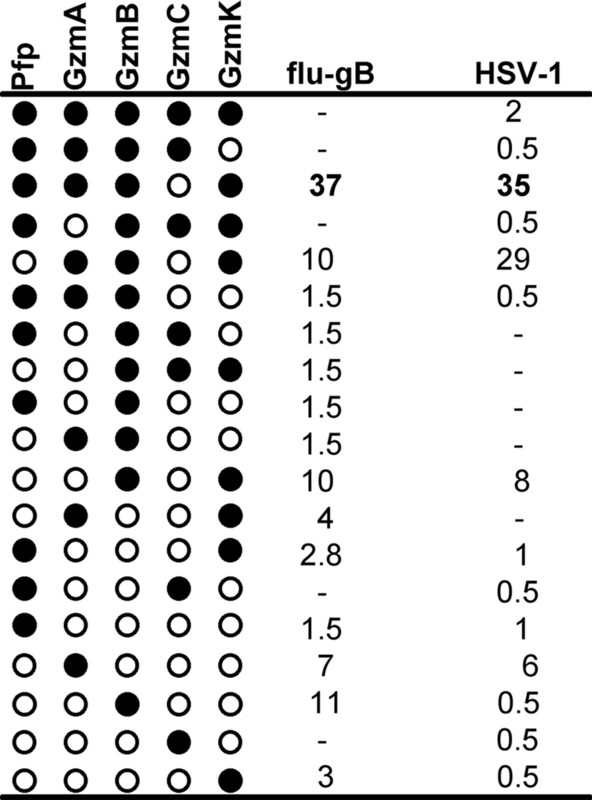 Frequency (A) and number (B) of cytolytic transcripts expressed per CD8+ CTL is shown. For acute time points, n = 151 CD8+ T cells, harvested from six mice for three individual experiments. At late time points, n = 92 CD8+ T cells harvested from 15 mice for three individual experiments.